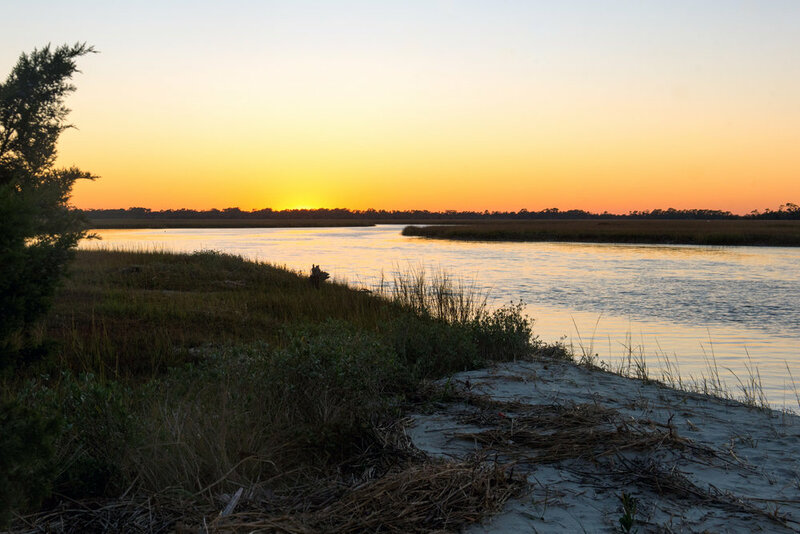 Otter Island is part of the St. Helena Sound Heritage Preserve, just a short boat ride from the mouth of Big Bay Creek on Edisto Beach. The island is a wildlife-management area under the protection of the South Carolina Department of Natural Resources. Covering approximately 2000 acres, most of the island is marsh with around 500 acres of high lands and beach. Otter is completely uninhabited. No people, no power lines, zero running water. Scattered throughout the island are five primitive campsites with varying levels of accessibility. Camping is by permit only and is restricted to November 1 through March 31. The island serves as a refuge for migratory birds and sea turtles that are nesting. Restricted camping dates help keep these animals and their habitats protected during these delicate seasons. Taking a day trip to Otter is a must for those with an adventurous side. It is a stunning, expansive beach with a vastly different ecological expression at every bend. Wide, sweeping beaches that hug large grassy marshes swiftly turn into a forest of stark silver sandblasted trees profiled against the white sand. The south side of the island holds one of the finest examples of an untouched maritime forest on the East Coast. The hurricanes over the past two years have pushed the dunes back into the forest, flooding the underbrush with sand and creating a whimsical, magical look to the woodlands along the beach. The stark open area beneath the trees, where the dunes are now spread out, appears manicured—as if created for picnics and lounging. However, use extreme caution if you explore the woodline, as Otter is home to a very healthy population of eastern diamondback rattlesnakes. Otter Island is well known for being used as target practice during World War II by the Tuskegee Airmen. Generations of Lowcountry residents have collected buckets full of brass bullet casings from the beach. Years ago, bullet hunters could simply walk the beach and gather them by the hundreds. Nowadays, the beach seems to have been picked mostly clean, with the casings only found in the marshes and creeks. Removing any artifacts, shells or animals from Otter Island is forbidden. Camping on Otter Island is not for the faint of heart. It is primitive camping in its truest form. There are no restrooms, no running or even drinkable water, no electricity, and only one campsite has a metal fire ring. You pack out everything you bring in, including your trash—all of it. Campers should definitely plan to bring their own firewood as downed wood is scarce, and you are not allowed to chop down trees. Each campsite has its own personality with some only accessible by kayak. All are waterfront and provide stunning night views and sounds of the waterways or ocean lapping the shore. Your stay on Otter has the potential to vary wildly in climate from day to day. The permitted camping times, November to March, are arguably some of the windiest and most volatile months of the year. Prepare for cold temperatures and high winds, especially at night. On the opposite side of the spectrum, pack a pair of shorts and flip-flops for the inevitable warm day you otherwise might not have expected. While whitetail deer are the only large mammals on the island, don’t expect your stay to be quiet. Bald eagles can be spotted as they rest in the treetops between hunting trips. Pods of bottlenose dolphins peruse the shoreline—at times it seems as if they are looking at campers with as much delight and curiosity as people look at them. Campsite number one is a great location for dolphin watching and you may even catch them strand feeding on the long sloping beach just as it bends into the river. Countless species of seabirds living in large groups, shorebirds tiptoeing through the marshlands and migrant birds enjoying a rest inhabit the island year round. Avid bird-watchers and photographers will appreciate the constant flurry of aviary action all around. The less frequently spotted bobcat roams the island deep within the interior of the maritime forest and marshes and hunts rodents, birds, and other small mammals. The raccoons of Otter Island are not nocturnal like their kin farther inland. The coastal raccoons of the Lowcountry hunt and forage according to the tides. If you see a raccoon out and about during the day on Otter Island or Edisto, it doesn't mean it’s sick—probably just means it’s low tide and time to eat! 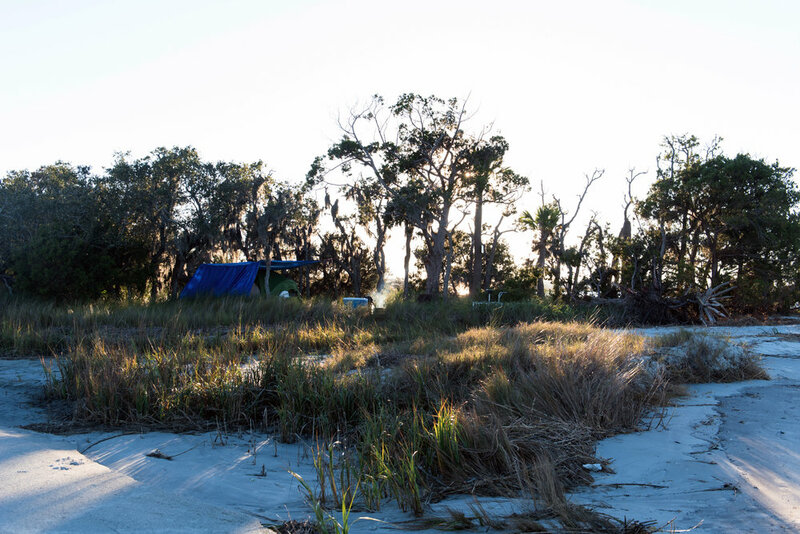 Camping on Otter Island has been on our expedition list for the Explore Edisto magazine for quite a few years. Otter is wild and has a dangerous reputation. People will tell you to be very careful if you dare to go and to take someone who knows the island and waterways with you. Only go during high tide, only go in the daytime, and NEVER ever go into the woods. What’s so scary about Otter Island? Once our plans to camp on the infamous Otter were out in the open, the public reaction was less than enthusiastic. Having been to the island for relaxing beach days, people’s warnings seemed such a contradiction of imagery to the peaceful island I had spent hours strolling in the sun on. On one hand, I had beautiful memories, and on the other, I had cautionary tales of wilderness and innumerable rattlesnakes. According to local legend and eyewitness accounts, the rattlesnake numbers are infinite. 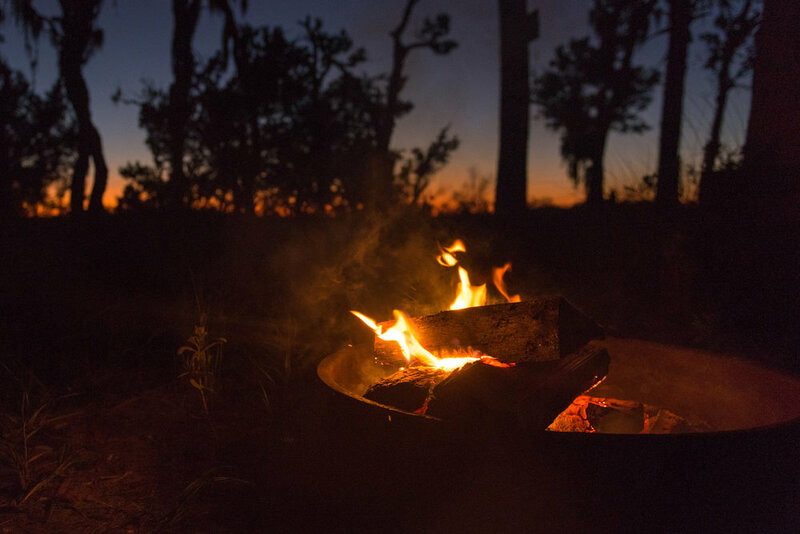 Having never ventured into the tree line or set eyes on any of the five campsites, my imagination stewed up ridiculous visions of snakes swinging from every limb and the ground throbbing with venomous bodies carpeting each step. We secured a boat ride to our camping spot from the Edisto Marina and hauled our gear down to the ramp. Awaiting us were Brian Bell of the Edisto Marina and Captain Newton Boykin aboard his small flat-bottom boat. On our third trip down to the dock carrying supplies, he asked if we were staying for two nights or two weeks! Shortly after departing, he had to take us back to the dock because our excessive gear combined with four passengers was sinking the little flat-bottom boat. We were prepared! We had wood and lots of water, two packs full of clothing, a large cooler, plus the tent and a smaller bin with dried goods, rope and various camping supplies. It was windy but sunny during our departure and we lounged on the dock while we waited on the boat to return to pick us up after dropping off our copious amounts of gear at campsite number one. Campsite one is situated at the most northern point of the beach. It’s actually a small ridge that comes out where the beach ends and the river winds back into the island’s interior. The campsite is large and a pathway meanders quite a ways back through tall grasses, offering a wide variety of camping locations. We chose to set up directly on the point, where the fire ring was, so we could see the water and access the beach right out of our tent. The location was absolutely stunning. We started unpacking and setting up camp and laughed about our overpacking. The wind picking up around us should have been a cue to have a little more faith in our packing instincts. We set our tent up with the back facing north. We also set up a large tarp that went under the tent, up behind and then over it, which we tied to the surrounding trees, in case we needed extra protection in case from a rainstorm. It would also block any breezes as we were in a tent made for warm-weather camping with a full mesh top and thin rain fly. This would prove to be a flawed plan as the wind continued to escalate. Once we set up the sun dipped quickly, so we took a short stroll down the beach to grab a few photos and stretch our legs. The temperature was plummeting and we quickly ended our walk to to warm up around a fire and cook dinner. Dinner was accompanied by a glorious color palette in the sky. A pod of dolphins slowly swam by. The wind continued to gust, but we stayed cozy by the fire despite the brisk temperatures. The rate at which we were burning through the wood was a little alarming, and we knew in the morning we would have to scrounge for downed limbs to cook with. That evening the winds picked up to gale force and were relentless. The tarp kept the wind out of the tent, but our ropes were not tied tight enough to hold the tarp taut. The violent winds ripped at it all night and the noise, which sounded like a giant potato chip bag crinkling, was nonstop. We didn’t sleep much and Caroline gave me a severe side-eye over my tarp-hanging skills. I’m still convinced the noise was better than freezing wind, but we have agreed to disagree. The wind stopped at sunrise as if on command. We poked our groggy heads out of the tent to the most awe-inspiring sunrise imaginable. Breakfast and coffee were in order after washing up in the chilly water of Fish Creek. Our goal for the day was to walk the whole shoreline of Otter Island and back. We set out with heavy layers, our cameras, water, a few apples and protein bars. Ready to explore. The weather warmed up quickly after noon and we peeled our layers off as we made our way down the shore. The island changed so drastically every mile or so. Photographs taken at one point would vary so greatly from those taken a half mile away, you could assume they were of different islands altogether. Fascinated by each new change in the landscape, we continued our walk. Every bend brought new and dazzling scenery. The long sweeping dunes and wide beaches turned into a short beach that tumbled into hard clay at the waterline, which created water-filled divots and holes that varied in size from a pen tip to feet across. The dune line to our right rimmed a marshy waterway like a crater. Tall grasses and water birds dotted the landscape, and a waterway you would have never imagined was just a few yards from the ocean. Our walk of the whole beach of Otter Island took about four hours at a slow pace. We stopped frequently to marvel and take photos. We poked our heads inside the mystical tree line, where the dunes have washed away the underbrush. Once the sand ended the underbrush created a thick, impenetrable wall of jungle. The foliage in some areas was so tight and packed together you couldn’t even see a foot into the forest. Here the maritime forest, so immense and thick, had a foreboding feeling. All along the beach, we passed by thousands of sand dollars, seashells and various parts of boats and buildings that had washed ashore from the previous hurricanes. Our walk ended in a landscape similar to where it began, with the wide beach and sprawling dunes fading away slowly into a river and marshlands. We turned around and began our trek back to the little campsite on the ridge, ready to kick off our boots, soak our feet in the cool, crisp water and enjoy another artist’s sky as the sun set on Otter Island.